Perfect ski conditions without much need of snow making are secured by the location in the midst of high mountains. 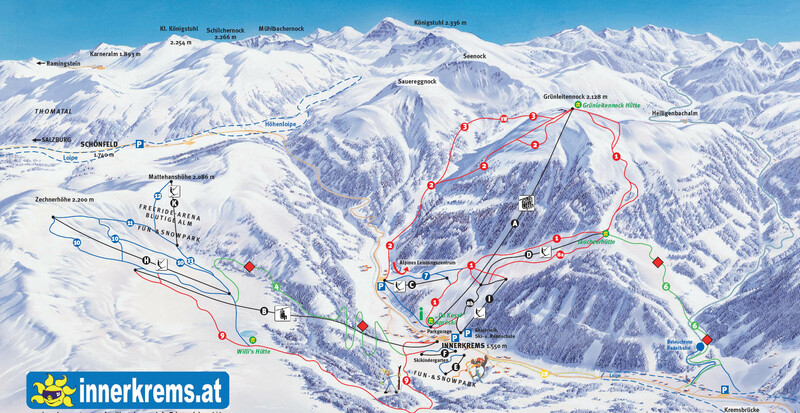 Skiing itself is in the altitude of 1.550 - 2.200m, 35km of mostly red difficulty ski slopes fits the advanced skiers. Freeride zone, beginners lifts and meadows for children, fun-snowpark, 20km of cross-country skiing trails. A resort to consider for families and sportive skiers. Family friendly Hotel Berghof enjoys a central location in the resort Innerkrems right at the slope at an altitude of 1560 meters.